The stone from The place of the Thing began its journey from Athens to Kassel last May. After being celebrated, ignored and even called into question by collectives and individuals in Athens, one of the stones remained in the city. It was adopted (stolen?) by refugee collective LGBTI and its current whereabouts are unknown (see Statement 2). The second stone arrived at Kassel in June and, after being exhibited in the gardens of the Museum für Sepulkralkultur, will be auctioned on e-bay. In the end, neither stone will be buried at the historical Thingplatz in Landau (Wolfhagen), 38 km from Kassel, which was the initial aim of the project. As a result, the project will remain unconcluded or, if you like, the project will have failed. Failure has been from the very beginning the state of grace of this project. 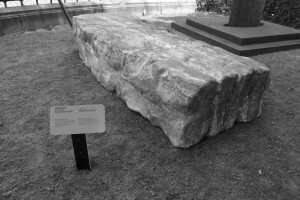 Even though the massive stone, a copy of the “Oath Stone” from the Athenian agora, was a pretext for the mobilisation of the various collectives that agreed to include it as one of their own performative agents, the fact that many of these collectives opted to ignore it turned it into a ghost ship. Nocument (sic): neither monument (vestige or fetish of a millennial culture) nor document (trace of an ecumenical encounter between committed artists and collectives) (see Statement 1). By the time the stone arrived at Kassel (where it was received as an “artwork”) it had become a lie and a non-work. Rubble, perhaps, from a bridge connecting Greece and Germany that had been, in short, the general aim of this Documenta. The stone was welcomed by Documenta’s audience, who participated in the project with dedication and candour not shown beforehand by any other collective. (Their commitment was so zealous that anonymous graffiti appeared on it denouncing the falsity of a plastic stone!). 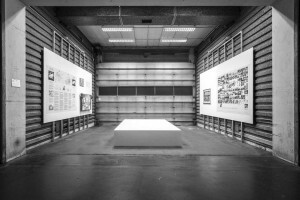 And it was by taking part unreservedly that the audience at Documenta made the project fail. The burial of a piece of plastic in the same grounds once used as Thingplatz was the kind of indigenous exorcism that could only be carried out by a group capable of an ironic – and therefore critical – view of its own identity. We did not find this in Documenta. Without the necessary irony, such an interment would only serve to solemnify the death of something that was never alive: yet another liturgy aimed at reaffirming a myth of collective identity. The spectators at Documenta deserve a ceremony in line with their convictions. Let us therefore bury the stone on e-bay. Let the sovereign collective of Documenta – its audience – free itself from the idols that sustain it. Let the true price ”top” the false value. The project The place of the Thing by Roger Bernat/ FFF will remain unconcluded on September 17, the last day of Documenta 14. The copy of the “Oath Stone” that was brought from Athens will be auctioned on e-bay with a starting price of 1€. Having lost all symbolic value, it will be left to the collective composed of e-bay purchasers to decide its market value (if it has one). The stone was made by Greek set-maker Freddy Gizas using expanded polystyrene, fibreglass and paint. It can be used as an exterior bench, table or bed, or as interior or garden décor. Measurements: 250 x 70 x 50 cm. Approximate weight: 40 kg. Simplemente quiero decir que su artículo es tan sorprendente. su alimentación a guardar hasta la fecha con acercarse correo. Gracias un millón y por favor, mantener gratificantes de trabajo. : 100 Sessions Plénières Du Parlement Européen Votées Par Des Personnes Sans Représentativité.